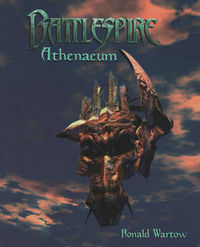 The Battlespire Athenaeum is the official hint and strategy guide for An Elder Scrolls Legend: Battlespire. "Unlock the Secrets of The Battlespire! You hold in your hands the OFFICIAL Battlespire Hint Book. It contains the necessary charts and maps that detail every object, weapon, potion, monster and person you are likely to encounter and shall instruct you in what you need to know in order to survive the Battlespire. Read about the intricacies of character creation and the importance of magic potions. Look up the answers to every puzzle, riddle and password you will need to move about as you figure out how to overcome the evil cunning of Mehrunes Dagon, the Black Daedra Lord who has captured the Battlespire that you must free. Armed with the knowledge contained within this tome, your wits and cunning shall be dramatically enhanced. Who knows, you might survive the contest after all..."
Every Elder Scrolls game presents the player with rich flights of fancy, usually broad and fascinating tapestries. The stage for these epics is Tamriel, a gigantic contienent of striking and diverse terrain, cultures, provinces, and impressive pockets of civilization. The Tamrielic Calendar records thousands of years of angst, jubilance, and tragedy. The vast continent that is Tamriel evolved with panoply of fits and starts. In the 1st Era, before the contemporary political divisions were firmly incorporated, destructive wars of conquest and succession, bureaucratic infighting, trade conflicts, and horrible plagues tore the land asunder. Powerful clans took turns controlling Tamriel's 9 provinces. Despite this, the great city-states of Daggerfall, Sentinel, and Wayrest sprouted and flourished. The 2nd Era dawned brightly. The growing class of enchanters formed the first Mages Guild early on. The honeymoon lasted but 200 years, for civil wars, insurrection, and assassinations of major political figures came to pass at an alarming rate. The middle years found the dreaded Khahaten Flu dominating every aspect of Tamrielian life. Not a single inhabitant was left untouched by this scourge. The 3rd Era began with political sanity restored. For the first time a single individual, dubbed Emperor, forged all of Tamriel's territories into one great empire. Tiber Septim's Dynsaty has lasted until the present day, almost half an era. The long line of Emperors Uriel began in E3 53. The Uriels instilled forward-thinking concepts of stability and harmony throughout the land. Everyone benefited and prospered. In 3E 389, the Imperial Battlemage, second in Tamriel only to the Emperor, decided that Uriel VII needed a well-earned "vaction". Cating the most powerful spell conjecturable, Jagare Tharn imprisoned the unsuspecting Emperor in a pocket universe, a timeless dimension, a place of no return. For 10 years, the mad wizard kept Uriel incarcerated. A brave adventurer traveled Tamriel far and wide, found the mystical object of release, and freed his Emperor. This hastened the shameful downfall of the treacherous battlemage. Shorty after those heroics, another brave hero rescued Tamriel from unspeakable evil principally taking place in the city-state of Daggerfall. This story entailed court intrigue, treachery, knightly conflicts, and the inevitable struggle between good and evil. As you will see, Battlespire continues the tradition. Battlespire takes place during the time of Arena (roughly 3E 399) in a majestic tower, if you will, a medieval space needle, inhabiting its own pocket universe. Originally a war college for the training and sharpening of imperial battlemage skills, evil forces invaded this citadel of military of imperial battlemage skills, evil forces invaded this citadel of military [sic] civility. Now, monstrous minions block and thwart your every move. You must escape back to the benevolent confines of Tamriel at all costs. During this time, a host of societal institutions were suspended in so-called "pocket universes," to achieve a state of immaculate virtual reality. One such institution, deep in the ethereal plane of Aetherius, is the Battlepire. It is a proving ground, or sophisticated war college for prospective battlemages. Five special anchors clamp the Battlespire in place, connected immediately on arrival when towed in by the Great Star Galley. If all the anchors are disconnected, the Battlespire drifts outside of the nexus of rich magicka-currents, the entire platform goes black and dead, and the PC, the Battlespire, and everyone there perishes. At its heart, the Battlespire is an otherworldly dungeon, administered and maintained by 5 powerful battlemages. This clique is so select that future Imperial Battlemages are plucked from their ranks. The Battlespire is the ultimate testing facility for the Emperor's Personal Guard. Anyone entering is guaranteed to get a strenuous mental and physical workout. You are an eager stripling, who has looked forward to testing your already superlative skills in combat and magic in the Battlespire against the finest the Empire has to offer. The valued prize for succeeding is to become one of Tamriel's true elite, with a position in the Imperial Guards. Before you qualified to enter the Battlespire, a spirited competition with similar candidates transpired. Only the first and second place winners achieved entrance into the Battlespire. You place second, and arrive at the Weir Gate, the Battlespire's entrance. Your companion who bested you in the entrance trial, is roving the first level ahead of you. Unknown to you, the Imperial Battlemage, Jagar Tharn, (whose audacity in whisking the Emperor away is related above) secretly offered Mehrunes Dagon, the Daedric Prince of Darkness and Destruction, a deal on the Battlespire. One condition was attached — Dagon and his heinous followers had to kill all 5 battlemages to eliminate competition for Jagar Tharn's lofty position as the Imperial Battlemage. The carnage began, as the Battlespire was overrun with Dagon's minions. The governing battlemages were being popped like grapes. On arrival, though you are unaware of Dagon's antics, you sense something is horribly wrong. The Wizard of the Gate lies dead at your feet, and horrible monsters are looting and sacking the Battlespire. Death is suddenly a very real possibility. What was to be an interesting and enjoyable challenge has turned into a nightmare test of survival. To your astonishment, the competitor who defeated you in the entrance competition preceded you into the Battlespire. This companion is trying to escape, just like you. Fortunately, the companion leaves behind helpful missives. While you do not know this when Battlespire begins, the companion needs to be rescued just prior to your escape from the tower. Because of the nature of the Battlespire, there's no turning back. Up and out is the only way to go. Rules are non-existent, and all bets are off. Only through dangerous conflicts and discoveries will you make it to the summit to confront Mehrunes Dagon, the vicious new lord of the Battlespire. "...and the Emperor then commanded to bring forth the two champions who had served him so well, who knelt before him and received his blessing. He bid them rise and said to them, 'Let all present know how these two have served their Empire, for had not Jagar Tharn been robbed of the support of the archfiend Mehrunes Dagon and his fell minions, then Ria Silmane and her champion might never have revealed Tharn's imposture, and long might the rightful emperor have languished imprisoned in Dagon'sdark prisons within the Void.' And he then made them great presents of land and chattels, and raised them up among his counselors, and conferred upon them offices of great importance in his Legions." "Reinvestment of Battlespire is neither feasible nor desirable at this time. The open provocation and sweet temptation this installation presents to the Daedric Powers is obvious from recent events, and the installation is of no significant value to the maintenance of the Pax Imperia. In light of recent turbulence in the Border Provinces, and considering more pressing demands upon the treasury, we recommend that the gates to Battlespire be sealed indefinitely." "The Emperor questioned the heroes closely. One said that, when struck by the enchanted sword, Dagon appeared to have been sucked away and compressed into an ever-smaller volume, and then to have disappeared. The Emperor then inquired among his counselors how long we might be free of the Prince of Destruction. Their answers were various, hopeful, and unpersuasive. 'You have done all that might be done, sighed the Emperor, but Oblivion cannot long hold Dagon, and when he returns, he surely will count us among his most-cherished enemies.'" Note: This article is a stub. You can help by expanding it. This page was last modified on 8 April 2019, at 03:57.